Nic (Nic Sampson) and Natalie (Natalie Medlock) return from a holiday to find their home not quite in the same state they left it. Their friends, another couple, Sam (Sam Snedden) and Kura (Kura Forrester) have been housesitting. It begins by establishing a premise that echoes many others, but soon derails off course. While the domestic setting stays the same, the characters’ roles randomly change and morph at the blink of an eye. Partners swap, adults become children, backstories alter. And as the plays progress, the fourth wall begins to break down too (if it was ever really there). 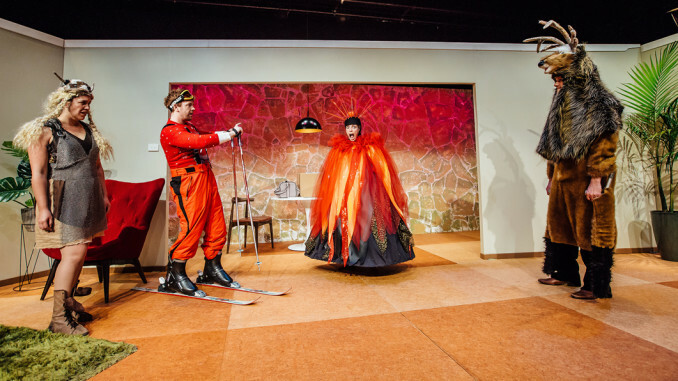 This is Marius von Mayenburg’s Perplex, a piece of German absurdist theatre that takes the well-worn domestic drama as its subject, but isn’t satisfied with merely poking fun at the genre; it has to squat and take a dump all over it too. Most of the time Perplex tends towards parody rather than deconstruction, where attempts at subversion are more prankish than deeply interrogative. Director Sophie Roberts handles the overall concept well, but the performances tend to overplay the laughs. For a play that relies heavily on comedy to present its ideas, it’s unfortunately inconsistently funny. The humour is so overly self-conscious you can’t help but feel the play is constantly winking at you, giving little room for a genuine reaction. The only thing missing is a laugh track. Like most postmodern narratives, it often lays down the rules of the game to the audience as it indulges in them. Some of the most direct moments talk about the very act of monologuing or the four-person play. It’s not revolutionary stuff, but it’s not hard to see why these metatheatrical jokes are appreciated by theatre-literate audiences. Perplex‘s comedy hits hardest when it rejects logic and appropriateness completely, embracing chaos and juvenilia instead. Where outlandish scenarios are treated by the characters’ with an unreal seriousness. It’s these moments the actors are given a chance to shine: schoolboy Sampson demonstrating martial arts, Medlock as a volcano, Forrester’s physical comedy, and Snedden’s Elk and showerthoughts. But while the cast is more than up to the challenge of the play, switching characters and performance styles frequently, it occasionally seems less like a piece of absurdist theatre and more like an intentionally bad sitcom. The result is often hysteria and shouting, lacking the wit or satirical bite of the plays it seems to be making fun of (think Who’s Afraid of Virginia Woolf or God of Carnage). The Nazi jokes, which just have no potency on our local stage, feel especially lost in translation. To Mayenburg’s credit, it’s always interesting to watch because it follows no obvious rulebook and basically throws everything into a theatrical blender. It also raises the question of whether we’re more forgiving to narratively experimental works, giving them room to make mistakes and allowing more insightful readings. Moments that would be deadly in more naturalistic plays survive through sheer uncertainty of intention. The design elements function well in adhering to both the faux-realism of the domestic drama, while also allowing for the absurdist touches to come through. This is most apparent in Daniel Williams’ set which is bland and modern in all the right ways. The rubbish under the couch is especially fun to watch proliferate. But, for a change, it’s the costuming that comes out on top during the brilliant ‘Nordic Nights’ costume party. Elizabeth Whiting supplies a tremendous range of outfits from a Viking to the aforementioned Elk and volcano, creating a masterclass of visual comedy alongside the actors. As an attempt to dislocate not only the audience but the characters too, Perplex is mostly successful, never afraid of being crass to get its point across. The slipperiness of identities and the ever-changing narrative is the clearest theme of the play, and results in an appropriate allegory for our times. The message is clear: nothing is constant and any attempt to find meaning is precarious at best. But the idea that ‘all the world’s a stage’ is nothing new and seems to be better embodied in recent efforts such as Carl Bland’s Te Po and The Playground Collective’s All Your Wants and Needs Fulfilled Forever. Both of which balance self-awareness with genuine heart while also tapping into New Zealand’s cultural consciousness. Despite Silo’s efforts to localise some of the language with Kiwi-isms, Perplex lacks deeper resonance. The ending, in particular, as the fourth wall is practically eliminated, feels like an inevitable punchline rather than something earned. Fans of absurdist theatre should see this as a rare opportunity to catch a underrepresented style on our professional stages. Those expecting a conventional comedy are better off looking elsewhere though. Perplex is a particularly insular piece of theatre, aimed at practitioners and theatre buffs, first and foremost. It’s not that its references are vast and obscure, just that its irreverent tone would appeal more to those with a more jaded view of what conventional theatre aspires to be. A show that rewards more in retrospect than in real-time.